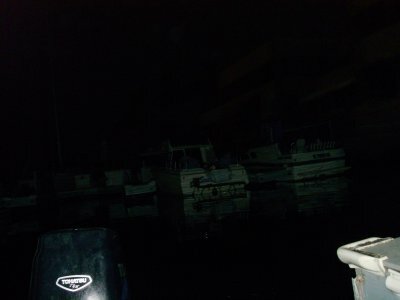 A transformer had blown up, causing King Harbor to be in pitch darkness – I hope it was not an attack by Al Qaeda. Luckily, we were prepared for darkness, so that did not stop us on our mission to liberate some lobsters. Last Sunday, divers dug three lobsters out of the rocks during the day at Terranea Resort – probably in depths no greater that 40 feet. 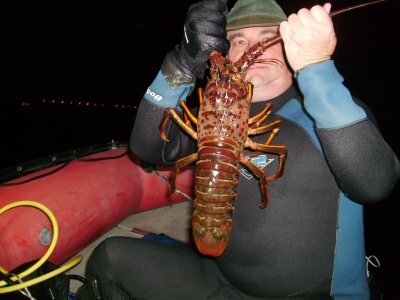 I talked to a free diver a couple of days ago who caught lobsters in Palos Verdes in 15 feet of water, only a week ago. Commercial traps look like they’re still in 40 to 60 feet of water. So, are the bugs deeper yet? Instructor John and I set out in his 14 foot inflatable yacht to a secret deep location off of Redondo Beach – or was it Manhattan Beach? We anchored in 75 feet of water. The water was pleasantly sort of warmer than I expected – especially after I peed in my wetsuit. I followed the anchor line to the ocean floor. This area is covered with little man made reefs – pipes, concrete boxes and miscellaneous construction crap that was dumped here years ago when the breakwater was completed – which breakwater, I’m unsure of – it could be Pearl Harbor for all I know. I literally saw dozens of short lobsters within the first few minutes of my dive. I came across a section of pipes and looked inside – monsters! Huge six to ten pound bugs! It was almost 9 PM, it had been dark for almost four hours – why were they still hiding in the pipes? Maybe I’ll bring some cat food next time? I came across a short section of a pipe with a monster lobster in it – the back was open and I was about to put my expert lobster liberating skills to use. I shined the light at the bug, and with my light mounted gauge, hit one of his antennae. He flew backwards as I turned my light off and swam to the other end of the pipe’s opening. I turned the light on, and there he was, sitting on the gravel, right out in the open. I went for the pin and got him! His carapace was soft enough so I could maintain a good grip before putting him in the lobster liberation bag! I checked the gravel and did general reconnaissance of the area – yes, there are lobsters deeper now. But like I stated earlier, there seem to be plenty still left in the shallows. John surfaced with one bug. This monster will no longer terrorize the seas! You can catch them deeper now, however, your bottom time to hunt is significantly reduced.